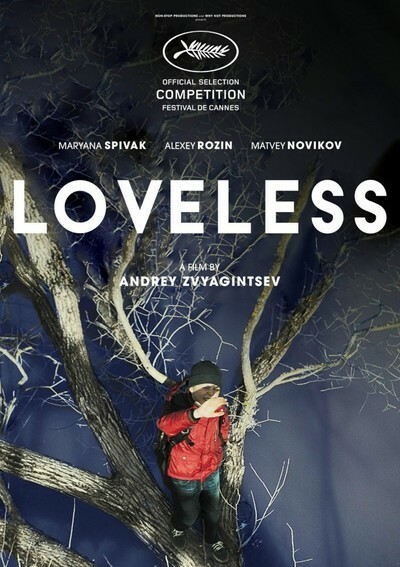 Loveless is a Russian film about a family of three; a mother, father, and son (and I use the term "family" very loosely); where the parents themselves are in the middle of ending their marriage that has been filled with nothing but resentment, anger, and misplaced pain. When we first meet the parents, Zhenya and Boris, together they are arguing over what to do with their son, Alexey, once the divorce is finalized; neither one of them sadly wants to step up the plate. Their son unfortunately hears this argument. Before they are able to come up with a viable solution, their son ends up disappearing and what we then experience is an emotional rollercoaster of sorts as we journey along with the parents as they attempt to find him. I have to say that I thoroughly enjoyed this film. I think that Maryana Spivak and Aleksey Rozin, the actors that play the mother and father respectively, did a great job of bringing these despicable but still very human and empathetic characters to life on screen. From the very beginning you feel for little Alexey, played by Matvey Novikov, and the hell hole that he has had to live in with parents that hate each other, their lives, and even him to a certain extent. Throughout the film much of their dialogue consists of arguments that hit below the belt, but once we're given context do take on a kind of merit that warrants unwanted sympathy for the two parents and I think that is a testament to the writing itself. Though, we see these parents as being horrible and can truly understand why it is that their son may have chosen to run away we can also see how these two people are victims of their own circumstances and its those unfortunate circumstances that played a major role in their now dreaded lives. Though, the storyline for the film is catalyzed by Alexey's disappearance, we sadly don't see much of him in this film. Therefore, if I had to pick a disappointment it would be just that. I do wish that we could have seen more of him. From the little that we do see of him I was definitely captivated by his performance and wanted to learn more about him. He was constantly in the back of my mind while watching this film because I really did feel for him and what it was that his parents had put him through for what I can assume had been his whole life. However, seeing as though this film is more so about the already deceased relationship between the two parents I can understand why it is that we don't see much of him. Still, I would have enjoyed his character not solely existing as a plot device to move the story along. I would also have to say that the ending left a bit to be desired. However, once I gave it more thought I settled on the idea that perhaps the filmmaker wanted to go for a more realistic ending to the story. If that was the case, then it makes sense, however, I still do wish that they could've given us a bit more. This is a film that heavily relies on its characters and their stories and it really does shine in that respect. This wasn't a laborious watch by any means. I really enjoyed being immersed in this sad, loveless world. If you ever have the opportunity to watch this film, please do; I don't think that you will regret it.